Jim Monaghan proudly serves as the Town Supervisor, since January 2016. Jim’s top priorities are to maintain Stony Point’s charm and wonderful community, while making it attractive and affordable to both young families and seniors alike. To accomplish this, Jim continues to fight to lower taxes through a combination of sound fiscal management and attracting new revenue sources. A successful career with the New York City Police Department was Jim’s start of a lifetime of public service and community. 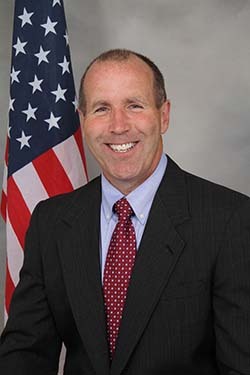 Jim worked in various roles over his 29-year career with the New York City Police Department attaining the rank of Lieutenant, before his retirement. As a Lieutenant commanding officer, Jim led by example, striving for superior performance, providing leadership, motivation and training. Jim and his wife Jackie have been married for 28 years and both are lifetime Rockland County residents. Prior to being the Town Supervisor, Jim served Stony Point on the Town Board as Councilman for two years. For the past 25 years, the Monaghan’s have resided in Stony Point, raising their children Jimmy, a Police Officer and Tara, an All-American College athlete, currently obtaining her Master’s degree in Occupational Therapy. Jim and Jackie are parishioners at Immaculate Conception Church. Community and family are important to Jim, as seen by his membership in the Haverstraw Elks Lodge the past 30 years, volunteering within the community, being a former manager of Stony Point’s Little League, a former coach for CYO Basketball, a former manager of Just for Fun Baseball, and a former Rockland PAL Boxing Coach.